The Memory Project engages Larchmont - Mamaroneck community members to share a significant memory. The resulting artwork will represent a joining of voices, where both participants and the audience can listen to, look at, and experience the memories of one another in the community we all call home. The Memory Project exhibit was installed for a week at Mamaroneck Artists Guild in November 2017. Close to 300 people participated and added over 350 memories to the project. 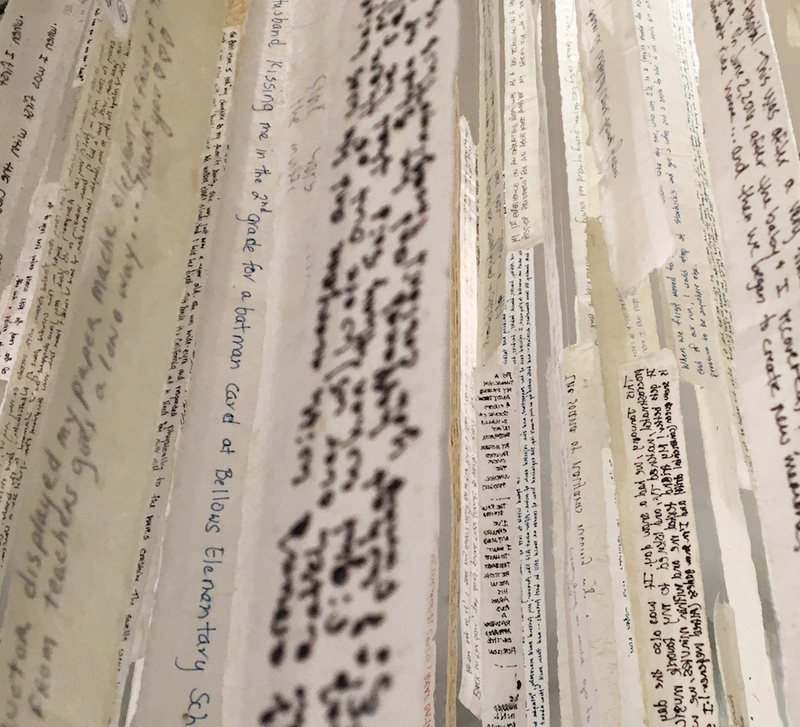 The memories were written on strips of delicate gampi paper, on cards of heavy printmaking paper or audio recorded. The skinny strips were dipped in wax and hung individually on invisible thread to create a visual and sculptural cascade that gently moved with the air current. Some of the memories were also hand transferred through a lithographic process with oil based inks onto scrolls of 10 foot long by 36 inch wide transparent gampi paper (you can see master printer Christopher Shore from the Center for Contemporary Printmaking and I working on these in the image above) hung in a way such that visitors could walk amid them and read the memories. An antique library card catalog held the hand written cards to allow people to read and share them with one another. Finally an audio piece wove recorded memories with local sounds that played through out the space, but could also be listened to on portable cd players. Click the button to the right to hear the recorded memories. It was an incredible honor and privilege to receive and read, to listen to and witness, all the memories shared. Funny, poignant, ordinary, extraordinary, joyful, painful, authentic...each and every one shared provided the opportunity for recognition, laughter, compassion, emotion and validation. Especially in these fraught times, the willingness to share, and listen was powerful and moving. Every single one has been typed and archived on the memory page. Below is a downloadable digital version of the exhibition catalog documenting the project. Print versions are available for purchase: http://www.magcloud.com/browse/issue/1448242. An exhibition catalogue of The Memory Project Exhibition at the Mamaroneck Artists Guild from November 7th through 12th, 2017. I want to thank ArtsWestchester for providing me with an Individual Artist Grant to pursue this project. I also want to thank the vendors and organizations below who generously donated their time, energy, and support to this Project by having all the materials onsite to help make participation easy and accessible! 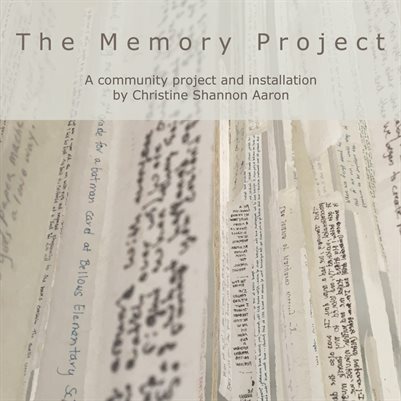 The Memory Project, ran by Christine Shannon Aaron, engages Larchmont - Mamaroneck community members to share a significant memory. The resulting artwork will represent a joining of voices, where both participants and the audience can listen to, look at, and experience the memories of one another in the community we all call home.